News | HNHS | Beetles of Hertfordshire – introductory offer extended! Beetles of Hertfordshire – introductory offer extended! We are pleased to announce that the introductory offer on our brilliant new book, Beetles of Hertfordshire, has been extended a by a month to Friday 10 August. However, demand for Trevor's James's ground-breaking book has already exceeded expectations, and we need to re-stock. This means that although we will continue to accept orders at the introductory price of £25 (plus £10 p&p if required), no further copies will be available for mailing or collection until after 23 July. 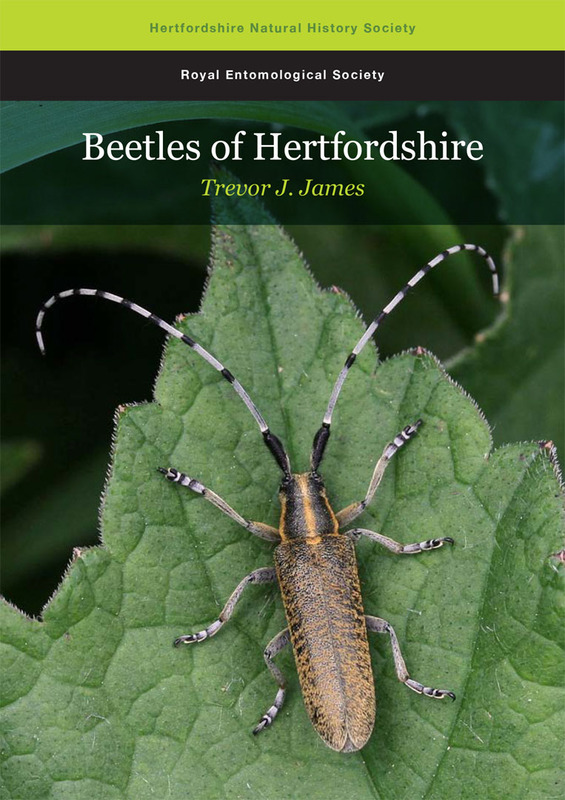 Written by Trevor James, the county recorder, the book provides an account of all 2,483 species of beetle so far recorded in Herts. Its publication marks the first time that all the beetles reliably recorded in a UK county have been covered in such a comprehensive way – making it a landmark for future studies. Published in hardback in the same, attractive A4 format as our five existing wildlife atlases, the book’s 496 pages include 750 distribution maps and more than 600 colour photographs. The special introductory price of £25 (plus p&p) provides a huge £20 saving on the recommended retail price. Click 'read more' for further details, including two launch events. In announcing our special offer we gratefully acknowledge generous financial support that the book has received from the Hertfordshire-based Royal Entomological Society and from private donors. 12.30pm, Friday 10 August at the Rye Meads Visitor Centre, Rye Road, Hoddesdon, SG12 8JS. Both events will provide and opportunity to buy the book, or collect a pre-ordered copy without incurring the £10 charge for postage and packing. It will delight not only experts but all those interested in natural history in Hertfordshire and beyond who wants to learn more about this intriguing group of species. Trevor James, the author, has been the County Recorder for beetles (Coleoptera) in Hertfordshire for 35 years. His book draws on his own, extensive fieldwork and studies, combined with a thorough review of historical records and the work of many other contributors. Trevor is the author of Flora of Hertfordshire (2009), also published by HNHS, a member of the HNHS Management Committee and was the 2015 receipient of the Society's 1875 Award for "an outstanding Hertfordshire naturalist".